See Insuvet Lente or Hypurin Bovine Lente for current hnadling information for beef lente insulin. Eli Lilly's old product--a 100% bovine lente insulin which is intermediate-acting. Current equivalents are: Hypurin Bovine Lente by CP Pharma and Insuvet Lente by Schering-Plough Animal Health. It shared the Lente composition definition of being a suspension of crystalline (ultralente) and amorphous (semilente) insulin in a ratio of 7 crystalline parts to 3 amorphous parts. Feline insulin compared with Bovine, Human, & Porcine versions. Up to 4 amino acids differ. The closest match is bovine with only one amino acid difference; the least close is human with four amino acid differences. Lilly also produced an 85% bovine, 15% porcine insulin under the same Iletin I trade name in the same various types. The blended beef/pork Iletin I was produced until ca. 2002. 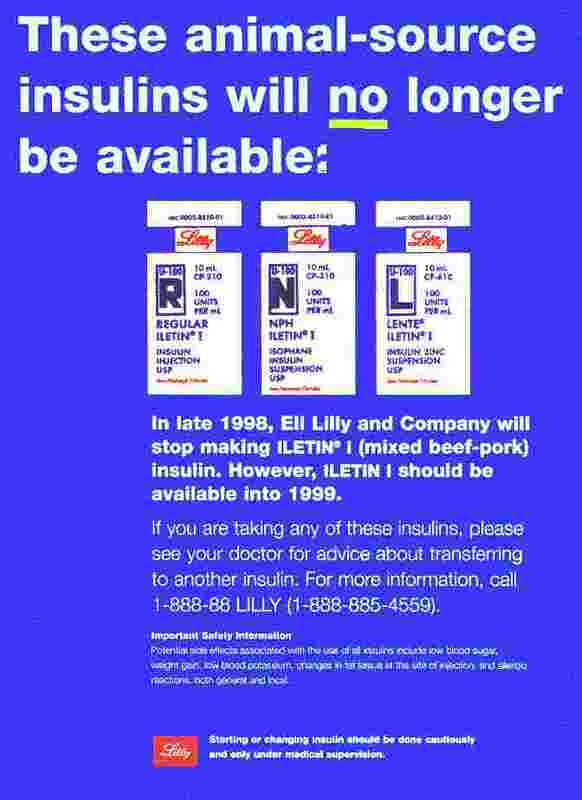 ↑ Discontinuation of Lilly's Iletin I beef/pork line of insulins; Iletin I Lente is at right.